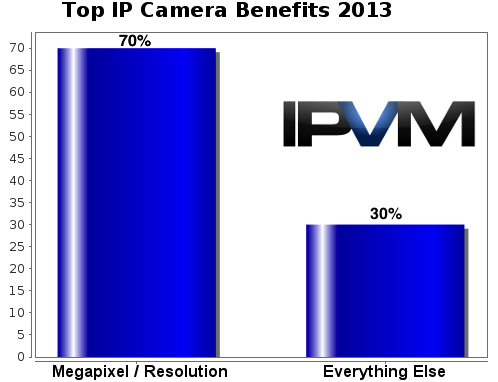 Megapixel was, far and away, the number #1 cited benefit in going to IP cameras / video. We asked over 100 integrators to name the "3 biggest reasons" they found, allowing them to name whatever they wanted. Over and over, the top one entered was megapixel. "Improved picture quality. Easily the item that sells the system and is the most visible factor." "Resolution is an easy way to wow the customer when on a sales call." "High resolution Video - we get so much more information from the HD quality cameras than we were able to get through VGA." "Video clarity that impresses the client." "Vastly improved image quality over analog with many resolution choices." "Allows the use of megapixel resolution surveillance cameras"
Everything else cited was scattered with a dozen different choices but no close nor consensus second choice. Other reasons cited included: panoramic cameras, wireless, breadth of product selection, remote viewing / management, edge based recording, and PoE. This confirms what is obvious to most in the industry, megapixel has been the 'killer app' and most critical driver in the shift from analog to IP. On the negative side, this underscores how dangerous manufacturer megapixel misrepresentation is as it plays into the biggest potential benefit. For instance, Arecont's ad and Avigilon's ongoing misleading marketing campaigns (though in fairness, Arecont has turned itself around, Avigilon continues). On the other hand, it underscores how powerful megapixel marketing is. Last year, Axis created controversy by declaring the megapixel race over - a claim that we disagreed with and that strongly divided the industry. Now, this Spring, the first Ultra HD / 4K / 12MP camera was announced. We will see soon enough if the next megapixel leap is upon us or if this crucial driver to IP is leveling off.